So is Messiah College history professor John Fea correct that “Enrollments in humanities fields — history, philosophy, literature, theology — at evangelical colleges have experienced a precipitous decline over the last decade”? Last week I looked at my own institution to begin to offer an answer to that question. But I admitted that I didn’t know whether the patterns I was seeing at Bethel — and what John may have witnessed at Messiah — prevail throughout the Council for Christian Colleges & Universities (CCCU). Fortunately, my retired colleague Rich Sherry happened to read my post and knew something I had forgotten: that among the other data supplied to the U.S. Department of Education by institutions of higher learning are the fields for degrees completed. Rich was kind enough to pull those figures from the IPEDS data center for CCCU schools for the period 2004-2014 and send them to me as a spreadsheet. Here it is, with a few calculations of my own, in case you’d like to dive into these numbers yourself. But let’s start by contrasting total enrollment in three humanities disciplines (English, history, philosophy) with the three professional programs I mentioned last week (business, education, nursing). Note: For each year charted, I’ve tried only to include institutions that were actually in the CCCU at that time. But the figures don’t change dramatically year by year if you include every school that was a member in 2014. But our focus is the humanities, which have fallen from 7.5% in 2004 to 5.5% in 2014. Ten years after Mark Noll lamented The Scandal of the Evangelical Mind, the study of literature and writing was already tailing off. 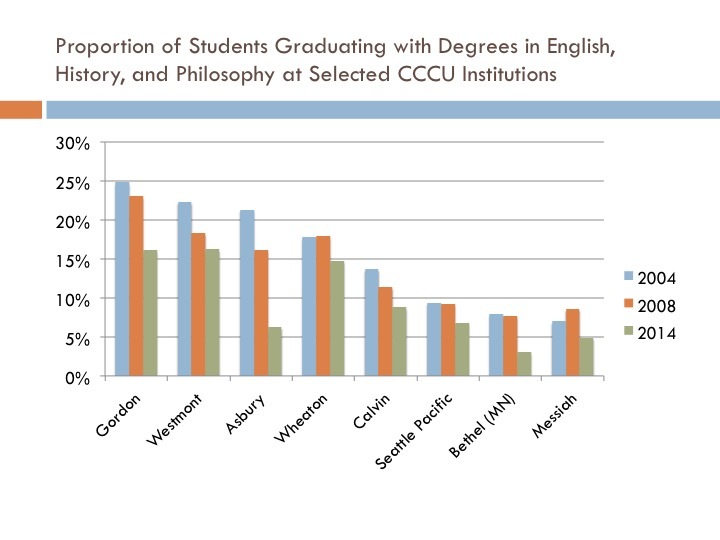 And while it could be argued that Noll and others helped spark new evangelical interest in philosophy, that discipline has been hit hard in the CCCU in recent years, losing a full percentage point of enrollment share and slipping behind where it had been in the early Nineties. Philosophy has long been an awkward fit on many CCCU campuses, but it’s striking to see the growing number of schools awarding not one degree in philosophy: about 29% of the CCCU membership in 2004; over 35% of a larger consortium in 2014. In that time, even schools with strong humanities programs have seen philosophy evaporate, including Asbury University, which had nearly 3% of its 2004 bachelor’s degrees go to philosophy majors but didn’t award any in that field in 2014. But even more strikingly, Asbury’s English department has seen its share of graduates plummet from 12% (higher even than business in 2004) to 5% in the same time period. (I’d be tempted to attribute this to growing enrollment in the school’s College of Business and its degree-completion programs, but even in absolute terms, the number of English grads has decreased by over 50%.) And the experience of Asbury suggests the real reason that I think we can reasonably talk about a “precipitous decline” in the humanities. For the whole CCCU, 2008 was when a significant two-year decline in humanities graduates can first be observed (from 7.5% to 6.7%). But even flagship liberal arts institutions that initially resisted that trend fell victim to it starting in 2010. For example, humanities at Gordon fell off slightly from 2008 to 2010, but then lost a third of their share of graduates from 2010 (24%) to 2012 (16%). Humanities at Wheaton actually grew slightly as the first decade of the century ended, then the English and philosophy graduate shares at that college each fell by a full point from 2010 to 2012. For the History department, the decline took two more years to be felt, but was even larger (from 4.0% in 2012 to 2.6% two years later). The less said here about my own institution’s recent history, the better. I’d rather go into my sabbatical feeling optimistic about a near-future that should see the birth of a digital humanities program. There are exceptions to the general rule of humanities in crisis at Christian colleges. 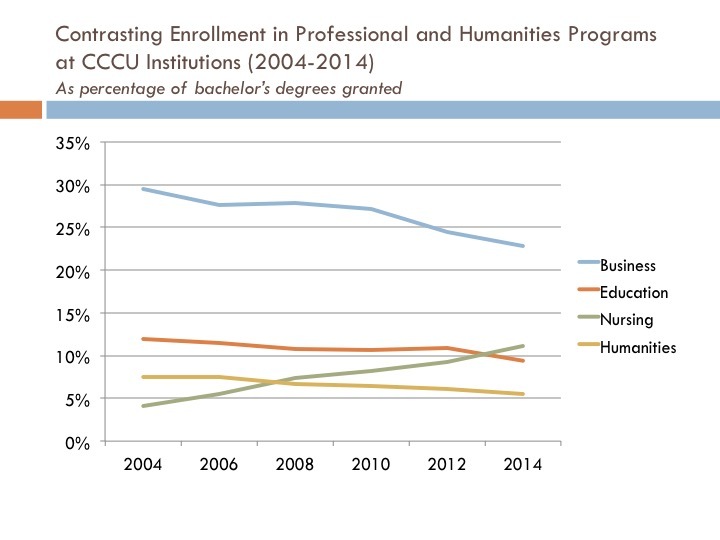 As recently as 2008, Regent University didn’t award any degrees in our three humanities disciplines; by 2014 those fields accounted for one in six Regent grads, with English alone surpassing 10% (though I wonder if communication degrees are reported separately; it’s a single department at Regent) and the two others both near 3%. Covenant College leads the way in the CCCU, with over 22% of its students graduating with majors in the humanities — almost seven points higher than the same statistic for 2004. If There’s a Crisis of the Humanities in Christian Colleges, What Does It Tell Us about Evangelicalism?